We continue the 2015 Team Previews today with one of our favorite teams in baseball for the coming year, the Chicago Cubs. They haven’t won a world title since 1908 – we just feel like this veil will be lifted at some point in the near future with this current core. And that would be good for the game of baseball and this poor tortured die-hards who follow this team as their first love. On October 12, 2011, the face of the Cubs franchise became forever changed. That was the day that Theo Epstein was named the President of the Chicago Cubs. You ask the common fan what Theo Epstein is up to, and they’re going to probably say ‘he’s the General Manager of the Cubs’. He’s not. He’s actually the GM’s boss, the GM is Jed Hoyer. Theo is making the overriding calls of this roster, and since he’s taken over they have an absolute haul of good young players and have made steady improvement. The questions remains: are the Cubs ready to take the next step from respectable and lovable team to contenders in the National League Central? We believe they are, and if you click ahead we’re going to tell you why. 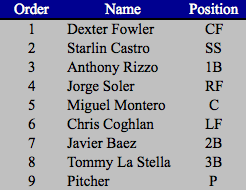 Veteran adds in the off-season were in the form of Dexter Fowler (who is a walkin’ machine) and Miguel Montero. These are not small additions. These are solid veterans who are good ballplayers who were not very heralded because they have not played for good organizations in their careers. It’s not unimaginable that the Cubs get the best baseball out of them they’ve played in their careers, and if they’re key cogs as leaders for this young team that makes a charge at a division title. 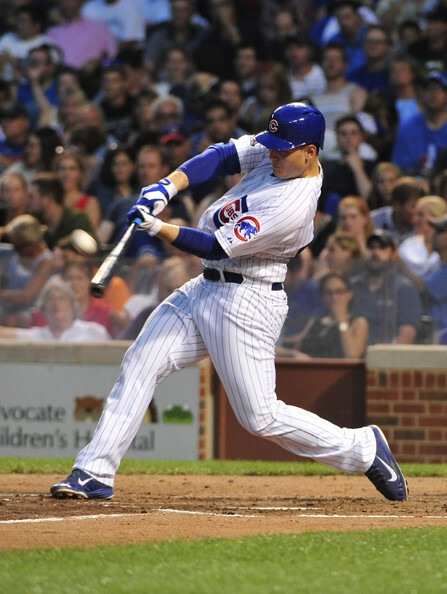 The crown jewel of the entire franchise at this moment; in our opinion, is going to be Anthony Rizzo. Rizzo really showed what he was capable of last season, being named to the All-Star team and finishing 10th in MVP voting. He was a .913 OPS bat, hit 32 home runs, drove in 78, hit .286 and was on base at a .386 clip. We believe he’s only going to get better of the next five years. He’s going to be a special power-hitting sensation that is the postgame talk of many a Wrigleyville resident at establishments like the Cubby Bear, Harry Caray’s, and Murphy’s Bleacher’s. The era of Rizzo has only just begun. Hitting in the three hole, he’s going to be a real force in the middle of this lineup that drives oppositions crazy. He hit .300 against LHP last season, we don’t think this was any fluke. He’s a legit .900 OPS bat, which are hard to find nowadays. The complimentary pieces around him are solid, high-upside guys. I think Jorge Soler turns into a really solid long-term outfielder for Chicago, but probably endures a little bit of a sophomore slump. I think it’s unlikely he holds down the clean-up spot or a middle of the order spot all season long, but should still be able to capitalize on mistakes and pitchers who haven’t learned the book on him well enough yet. Do I think he’s on the level of a Yasiel Puig whom he draws comparisons to? No, I don’t think he is on that level of a superstar, but he’s going to be very good in time. Starlin Castro has never really been given the credit he probably deserves for the kind of bat he is at the shortstop position. He’s been about a .300 hitter if you take out his .245 year in 2013 after four seasons in the big leagues. As he continues to refine his approach at the plate and becomes less raw (he’s just 25 this year), he’ll hopefully strike out less; but he’ll never be a guy who walks a lot or handles the bat perfectly in the two-hole. With improved contact rates, he should be expected to settle in as a .300 hitter long-term. Javier Baez struck out 41.5% of the time as a rookie. He also showed the power that made him famous – both in spring training and in a couple multi-homer games early in his Cubs campaign. A year ago right now, I think everyone thought that Baez was going to own this town for the next decade. Rightfully, now they’re not so sure. The truth is he’s probably going to continue to be a guy who ‘wows’ with his power and continues to strike out a ton. If they try to change his swing or approach to remedy the strikeouts, they risk taking away what makes him most dangerous. Then you’ve got the leftovers, Chris Coghlan and Tommy La Stella. Coghlan I actually like as a pretty scrappy everyday regular. La Stella is keeping the seat warm for the next big thing, Kris Bryant. I would consider the Cubs everyday lineup to be the strong point of their team, especially considering the upside of it if everything goes right. It’s not a bad little bench, either. Highlighted by Arismendy Alcantara, it also features David Ross, Mike Olt, Chris Denorfia, and Ryan Sweeney. Those are guys who can help you win games in certain roles. The Cubs can thank their President Theo Epstein for delivering them the ace they’ve needed, signing Jon Lester to a six-year, $155 million dollar contract this off-season. They now have a guy who can put them up 1-0 in a postseason series, get them through a Wildcard game, and stop skids should they encounter them every fifth day. The Cubs have never really had that guy. Jeff Samardija wanted to be paid like that guy, but Theo and the brass knew he wasn’t. He was dealt to Oakland for another gem prospect in Addison Russell who could somehow figure into this equation in the not too distant future. They have so much talent stockpiled in terms of position players. Jake Arrieta pitched like an ace last season in 25 starts; going 10-5 with a 2.53 ERA and 167 strikeouts in 156.2 innings pitched. From there – the rotation would appear to be shaky – but it’s actually no worse off than most of the teams around baseball. Jason Hammel and Travis Wood have experienced success in the big leagues and know how to pitch. Hammel was phenomenal in 17 starts for the Cubs in 2014 before being traded to the Orioles, and now he’s back. I’m not spitting you out a number or stat, but I’ve seen enough of Travis Wood dating back to his days with the Reds to tell you he’s a really good four starter who won’t hurt you there. You look at some of the duds being trotted out as four starters around the league and realize he’s a guy with a career 4.11 ERA who eats innings. We expect him to have his best season yet and be above .500 for the year. Kyle Hendricks is the wildcard and expected to snag the fifth spot. He’s 25 years old and had nice minor league numbers. The bullpen is probably what cost Dale Sveum his job, ranking among the worst in most statistical categories in 2014. We actually like their closer Hector Rondon pretty well, and with the tight games the Cubs are going to be playing this season he’s going to lock down a lot of those afternoon delight saves in the Windy City, we’ll pencil him in for 35 to 40. He was flat nasty at points last season. Wesley Wright, Pedro Strop, Neil Ramirez, Kyuji Fujiwaka, and Justin Grimm will be names you see a lot of in the box score. If they pitch to their potential, the Cubs will be a dangerous team. If there continues to be some problems in the Chicago pen, it’s going to be a disappointing year falling short of lofty expectations. The Sporting News picked them to win the 2015 World Series in one publication. Hell, they won the 2015 Series in Back to the Future, didn’t they? They’re not going to break the curse of the billy goat just yet entirely, but 2015 will go down as a magical year that puts this Cubs team back on the map. The NL Central is vulnerable, the Cardinals and Pirates have their own issues and aren’t quite the heavyweights that would give a young Cubs team like this fits in the past. They’re going to be just vulnerable enough for the taking. The Reds and Brewers are going to have handfuls of issues. This is the year they hang another banner and play with house money from there. Cubbies fans, we know you like your weed and your spirits. We suggest you have your one-hitters and Goose Island all stocked up. It’s going to be a wild summer in those bleachers, whether they’re functioning or not.